Today an international team of nuclear physicists announced the first scientific results from the Cryogenic Underground Observatory for Rare Events (CUORE) experiment. CUORE, located at the INFN Gran Sasso National Laboratories in Italy, is designed to confirm the existence of the Majorana neutrino, which scientists believe could hold the key to why there is an abundance of matter over antimatter. Or put another way: why we exist in this universe. The results of the experiment, called CUORE-0, were announced at INFN Gran Sasso Laboratories (LNGS) in Italy, the U.S. Department of Energy's Lawrence Berkeley National Laboratory (Berkeley Lab), and at other institutions in the US. The findings are twofold. First, the CUORE-0 results place some of the most sensitive constraints on the mass of the elusive Majorana neutrino to date. With these new constraints, the CUORE team is essentially shrinking the size of the haystack that hides the Majorana needle, making it much more likely to be found. 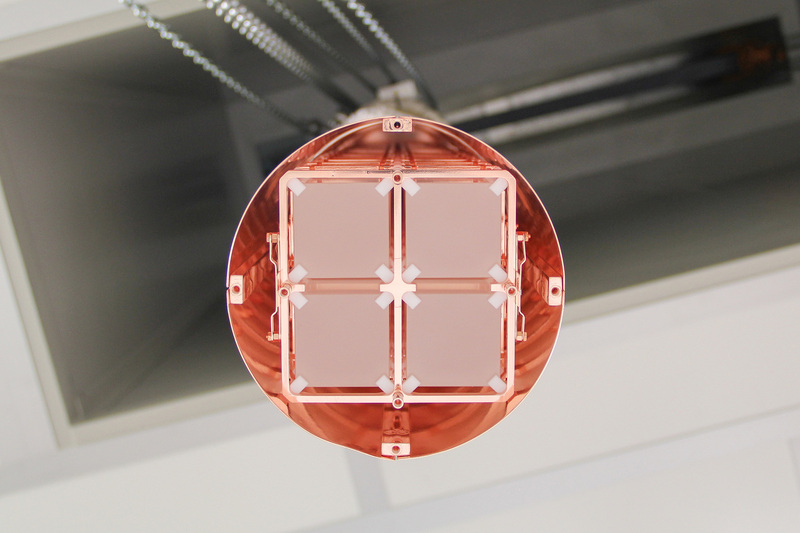 Second, the experiment, successfully demonstrates the performance of CUORE's novel design--a detector made of towers of Rubik's cube-sized crystals of tellurium dioxide. These towers are placed in a high-tech refrigerator that has been painstakingly decontaminated, shielded from cosmic rays, and cooled to near absolute zero. Today's results represent data collected over two years from just one tower of tellurium dioxide crystals. By the end of the year, all 19 towers, each containing 52 crystals, will be online, increasing CUORE's sensitivity by a factor of 20. 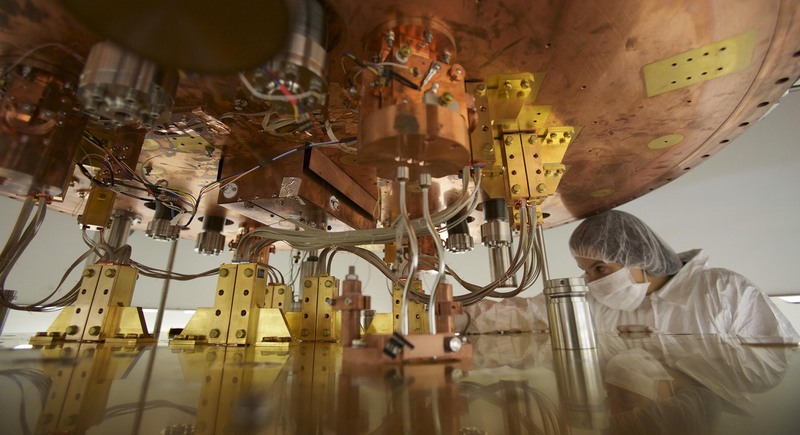 "CUORE-0 is so far the largest detector operating at a temperature very close to absolute zero," says Dr. Oliviero Cremonesi of INFN-Milano Bicocca, spokesperson for the CUORE collaboration. "CUORE is presently in its final stages of construction, and when completed, it will study the nuclear processes associated with the Majorana neutrino with unprecedented sensitivity." "With the CUORE-0 results, we've proven that our experimental design, materials, and processes, which include extremely clean surfaces, pure materials, and precision assembly, are paying off," says Yury Kolomensky, senior faculty scientist in the Physics Division at Berkeley Lab, professor of physics at UC Berkeley, and U.S. spokesperson for the CUORE collaboration. To pin down the Majorana neutrino, the researchers are looking for a telltale indicator, a rare nuclear process called neutrinoless double-beta decay. This process is expected to occur infrequently, if at all: less than once every septillion (a trillion trillion, or, a 1 followed by 24 zeros) years per nucleus. Unlike regular double-beta decay, which emits two anti-neutrinos, neutrinoless double-beta decay emits no neutrinos at all. It's as if one of the anti-neutrinos has transformed into a neutrino and cancelled--or annihilated--its sibling inside the nucleus. "In 1937, Ettore Majorana predicted that neutrinos and anti-neutrinos could be two manifestations of the same particle - in modern language, they are called Majorana particles," says Reina Maruyama, assistant professor of physics at Yale University, and a member of the CUORE Physics Board, which guided the analysis of the data. "Detecting neutrinoless double-beta decay would lead us directly to the Majorana particle, and give us hints as to why the universe has so much more matter than antimatter." Known laws of physics forbid such matter-antimatter transformations for normal electrically charged particles like electrons and protons. But neutrinos, which are electrically neutral, may be a special kind of matter with special capabilities. The proposed matter-antimatter transitions, while extraordinarily rare now, if they happen at all, may have been common in the universe just after the big bang. The remainder of existence, then, after all the annihilations, would be the matter-full universe we see today. The CUORE crystals of tellurium dioxide are packed with more than 50 septillion nuclei of tellurium-130, a naturally occurring isotope that can produce double-beta decay and possibly neutrinoless double-beta decay. For the experiment, the crystal towers sit in an extremely cold refrigerator called a cryostat that's cooled to about 10 milliKelvin or -273.14 degrees Celsius. Last year, the CUORE cryostat set a record for being the coldest volume of its size. In the very cold CUORE crystals, presence of both nuclear processes would produce small but precisely measured temperature rises, observable by highly sensitive temperature detectors within the cryostat. These temperature increases correspond to spectra--essentially the amount of energy given off--from the nuclear event. Two-neutrino double-beta decay produces a broad spectrum. In contrast, neutrinoless double-beta decay would create a characteristic peak at the energy of 2528 kiloelectron-volts. This peak is what the researchers are looking for. The CUORE experiment sits about a kilometer beneath the tallest mountain of the Apennine range in Italy, where rock shields it from cosmic rays. This location, as well as the experimental design, enables the sensitivity required to detect neutrinoless double-beta decay. "The sensitivity demonstrated by the results today is outstanding," says Stefano Ragazzi, director of the INFN Gran Sasso National Laboratories. "The INFN Gran Sasso Laboratories offers a worldwide unique environment to search for ultra-rare interactions of Majorana neutrinos and dark matter particles and is proud to host the most sensitive experiments in these fields of research." "While there's no direct evidence of the Majorana neutrino yet, our team is optimistic that CUORE is well positioned to find it," says Ettore Fiorini, professor emeritus of physics at the University of Milano-Bicocca and founding spokesperson emeritus of the experiment. "There is a competition of sorts, with other experiments using complementary techniques to CUORE turning on at about the same time. The next few years will be tremendously exciting." CUORE is supported jointly by the Italian National Institute for Nuclear Physics Istituto Nazionale di Fisica Nucleare (INFN) in Italy, and the Department of Energy's Office of Science and the National Science Foundation in the US. The CUORE collaboration is made of 157 scientists from Italy, U.S., China, France, and Spain, and is based in the underground Italian facility called INFN Gran Sasso National Laboratories (LNGS) of the INFN. The CUORE collaboration at the INFN Gran Sasso National Laboratory has set a world record by cooling a copper vessel with the volume of a cubic meter to a temperature of 6 milliKelvin: it is the first experiment ever to cool a mass and a volume of this size to a temperature this close to absolute zero (0 Kelvin). The cooled copper mass, weighing approx. 400 kg, was the coldest cubic meter in the universe for over 15 days. CUORE is an international collaboration involving some 130 scientists mainly from Italy, USA, China, Spain, and France. CUORE is supported by the Istituto Nazionale di Fisica Nucleare (INFN) in Italy and the Department of Energy Office of Science (Office of Nuclear Physics), the National Science Foundation, and Alfred P. Sloan Foundation in the United States. CUORE (which stands for Cryogenic Underground Observatory for Rare Events, but is also Italian for Heart) is an experiment being built at the INFN Gran Sasso underground laboratory to study the properties of neutrinos and search for rare processes. The CUORE cryostat is the only one of its kind in the world, not only in terms of its dimensions, extreme temperatures, and cooling power, but also for the selected materials and for the building techniques that both guarantee very low levels of radioactivity. CUORE is seeking to observe a hypothesized rare process called neutrinoless double-beta decay. Detection of this process would allow researchers to demonstrate, for the first time, the transformation of antineutrinos to neutrinos, thereby offering a possible explanation for the abundance of matter over anti-matter in our Universe. These transitions are only possible if the neutrinos are so-called Majorana particles, as suggested by Italian physicist Ettore Majorana in 1930s. The experiment will also be sensitive to the minuscule value of the neutrino mass. CUORE is designed to work in ultra-cold conditions at the temperatures of around 10 mK, i.e. ten thousandths of a degree above absolute zero. It consists of tellurium dioxide crystals serving as bolometers (radiation detectors which measure energy by recording tiny fluctuations in the detector's temperature). The cryostat was realized and funded by the Italian National Institute for Nuclear Physics (INFN); the University of Milano Bicocca coordinated the research team in charge of the design of the cryogenic system. When complete, CUORE will consist of approximately 1000 instrumented tellurium dioxide crystals. It will be covered by shielding made of ancient Roman lead, a material characterized by a very low level of intrinsic radioactivity. The mass of materials at the frigid temperatures near absolute zero will be almost two tonnes. An international team of physicists, including students and postdoctoral scholars from Italy and the US, worked tirelessly for over a year to assemble the cryostat, iron out the kinks, and successfully demonstrate its record-breaking performance. In the most recent operational test of the cryostat, the temperature reached 6 milliKelvin, equal to -273.144 degrees centigrade. This is stunningly close to absolute zero, which is equal to -273.15 degrees C. No experiment on Earth has ever cooled a similar mass or volume to temperatures this low; similar conditions are also not expected to arise in Nature. This gives CUORE the distinction of being the coldest cubic meter in the known Universe. The successful solution to a technological challenge of cooling the entire experimental mass of almost 2 tonnes to the temperature of a few milliKelvin was made possible through a strong collaboration with industrial partners of high profile such as the Leiden Cryogenics BV (the Netherlands), which designed and built the unique refrigeration system, and the Simic SpA (Italy), which built the cryostat vessels. Italy's National Institute of Nuclear Physics, at its laboratories in Gran Sasso, has received 120 lead bricks from an ancient Roman ship that sunk off of the coast of Sardinia 2,000 years ago. The ship's cargo was recovered 20 years ago, thanks to the contribution of the INFN, which at the time received 150 of these bricks. The INFN is now receiving additional bricks to complete the shield for the CUORE experiment, which is being conducted to study extremely rare events involving neutrinos. After 2,000 years under the sea, this lead will now be used to perform a task 1,400 metres under the Apennine mountain. The National Laboratories of Gran Sasso (LNGS) of Italy's National Institute of Nuclear Physics (INFN) has received 120 2,000-year-old lead bricks from the National Archaeological Museum of Cagliari in Sardinia. The lead bricks, together with the ship that transported them, had remained in the sea for 2,000 years, which reduced by approximately 100,000 times the albeit very low original radioactivity represented by one of its radionuclides, lead-210. In fact, lead-210 has a half-life of 22 years, so that by now it has practically disappeared in the bricks. It is precisely this characteristic that makes the lead extremely useful, in that it can be used to perfectly shield experiments of extreme precision, such as those conducted in the underground INFN laboratories in Gran Sasso. After 2,000 years under the sea, this lead will now be used to perform a task 1,400 metres under the Apennine mountain. The part of the bricks that is "adorned" with inscriptions will be removed and conserved, whereas the remaining part will be cleaned of incrustations and melted to construct a shield for the international experiment CUORE, a study on neutrinos, whose discoveries could contribute to the knowledge of this elusive particle and of the evolution of the Universe. Moreover, the INFN will perform important precise measures on the lead (and possibly on the copper found on the ship), to study the materials used in the Bronze Age. The lead bricks were made available as the result of a 20-year collaboration involving the INFN, its facilities in Cagliari, and the Archaeological Superintendency of Cagliari, with the support of the General Direction of Antiquity. As part of this collaboration, 20 years ago the INFN contributed 300 million lira for the excavation of the ship and the recovery of its cargo. The INFN would like to thank the superintendents Drs. Fulvia Lo Schiavo and Marco Minoja, as well as Doctor Donatella Salvi, for their collaboration. "The commander of that ship would certainly never have imagined that the lead would be used 2,000 years later for something that had to do with the Universe and the stars" - comments INFN President Roberto Petronzio - "History and Science can now speak to one another across the centuries, thanks to the research in High-Energy Physics". "This lead," - explains Professor Ettore Fiorini - "which is responsible for the CUORE experiment, represents an extremely important material for shielding the apparatuses used to conduct research on rare events - a material that must be totally free of radioactive contamination". Lucia Votano, Director of the INFN laboratories in Gran Sasso, explains that "it's great and unique that the most advanced and innovative technologies must rely on archaeology and the technology of the ancient Romans. The ancient lead recoverd from the bottom of the sea will be essential for protecting the experiment from natural radioactivity, which could obscure the rare process of neutrinoless double beta decay". Twenty years ago, an amateur scuba diver swimming off the coast of Oristano found a "navis oneraria magna", a 36-metre Roman ship dating back more than 2,000 years - between 80 and 50 BC - whose cargo consisted of a thousand lead forms. The ship had come from the area of the Sierra de Cartagena, in present-day Spain, and was probably headed towards Rome. In its hull, on a floor of copper, there were approximately 2000 lead bricks, together with various types of amphoras, four anchors, rigging, and everyday objects. The ship sank near the island that is today known as Mal di Ventre, a little more than one mile from the shore. Because the anchors were still in the prow and the bricks were in part still stacked, archaeologists believe that the ship sank without undergoing any sort of trauma and for reasons that are difficult to determine (perhaps intentionally sunk by the ship's commander himself). The relic and all that it contained remained under more than 30 metres of water on the sandy sea floor for 2000 years. The lead bricks weigh about 33 kg each and are 46 centimetres long and nine centimetres thick. The weight corresponds to 100 Roman pounds, which by law was the maximum weight that could be carried by a slave. The lead was a byproduct of silver extraction, yet in Roman times the market for lead was extremely important, given that it was widely used to produce everyday objects, such as water ducts, weights, and urns, and in the production of bronze coins and of the lead bullets for slings, a weapon used in battle by soldiers in ancient Rome. More than 200 of these bullets were found on the sunken ship. Each brick is engraved with an indication of who manufactured it, for example, Caius and Marcus Pontilieni, sons of Marcus; Quintus Appius, son of Caius; and Carulius Hispalius. These were families of Italian origin who were involved in mining in Spain. In various areas in the Mediterranean, archaeologists have found materials produced by the Pontilieni family and Caulius Hispalius, whereas Quintus Appius was unknown. Ancient lead is particularly useful not only for Physics experiments but also for certain uses in Information Technology. For this reason, throughout the world, lead found in ancient sunken ships (from the European galleons of the 15th century onwards to the ancient ships that sailed the Mediterranean Sea) is sought after. The CUORE experiment at the INFN National Laboratories in Gran Sasso is seeking to discover an extremely rare process known as "neutrinoless double beta decay", which would allow researchers to not only directly measure the mass of neutrinos but also to determine whether or not they are Majorana particles (i.e., with coinciding particles and anti-particles). The extremely important implications of this experiment regard the world of both the infinitesimally small (i.e., that of elementary subatomic particles) and the infinitely large (i.e., the Universe and its evolution). The CUORE experiment represents the most recent and ambitious development of the technique of bolometer of tellurium dioxide, with which the INFN has over 20 years of experience. The process of discovering and adapting the lead from an ancient shipwrek for use in CUORE was covered in Nature News. Read the article at nature.org.